The National Association of Black Women in Construction (NABWIC) honored US Representative Val Demings at the First Annual Florida Classic Weekend Legislative Breakfast last Saturday at the Citrus Club in Orlando. Demings, a two-term member of Congress from the 10th Congressional District of Florida, which includes Apopka, is being honored for her continuous support of the organization and community on a local and national level, according to the news release provided by the NABWIC. The capacity crowd at the event got a twofer as Orange County Mayor-Elect Jerry Demings was in attendance, as well as Apopka Mayor Bryan Nelson and Orange County District 2 Commissioner Rod Love. Congresswoman Demings rendered a heartfelt speech to the crowd and emphasized on working together and acknowledging the fact that we as prosperous individuals did not get to this point on our own. We have to come together as a team and get the job done. Congresswoman Demings. was honored for her continuous support to the community and NABWIC, on a local and national level. The event was hosted by NABWIC leadership Mina Robinson. The NABWIC is a Florida-based, Not-For-Profit organization, formed in 1991 to address the unique challenges of black women in the construction industry. Its mission is to champion and empower women in the construction and related industries to reach their full potential, and to represent the voice of black women in construction in both government and industry arenas. NABWIC operates under the leadership and direction of its founder, Mrs. Ann McNeill, and is governed by a national board of directors comprised of women and men who are entrepreneurs and who are actively engaged in construction-related trades and industries. 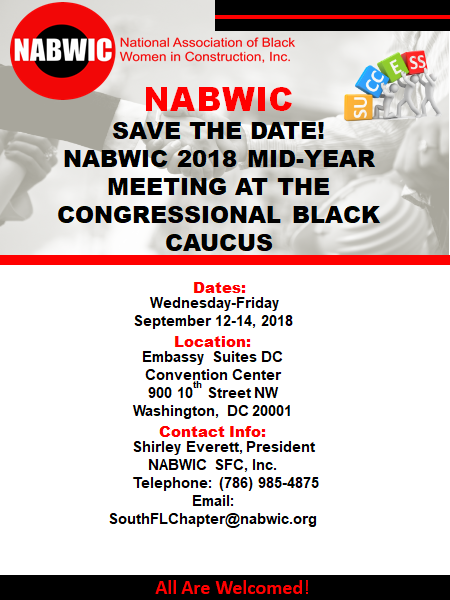 With over eight chapters and areas throughout the country, NABWIC provides a forum for its members to meet and exchange information, ideas, and solutions on a local level within specific geographical areas such as Florida, Georgia, New York, Michigan, and Texas. NABWIC offers members an opportunity to expand personal and business networks, maintain awareness of industry developments, improve skills and knowledge, and make a contribution to other women in the construction industry.